Mandeep came to New Zealand in 2008, he studied hard, he worked hard and he lived a quiet life in the Kiwifruit capital of New Zealand. Always having in mind that one day he would hopefully become a resident in this beautiful country. For a while in early 2011, it looked like his dream would never come true. This was when the New Zealand Kiwifruit industry was struck by its biggest crisis during its existence, the bacterial kiwifruit vine disease (PSA) struck. It is thanks to a very organised and combined approach of the government, growers, pack houses, Zespri, the industry’s marketing body and the tireless efforts of mostly Indian orchard managers that the industry recovered again. 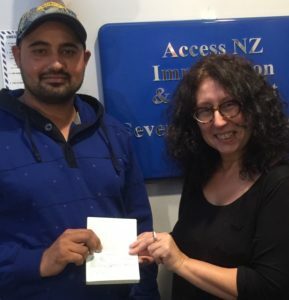 We are therefore delighted that Immigration New Zealand recognized the important contribution orchard managers like Mandeep have made in bringing a million dollar industry back on track by granting him residence in this beautiful country.